So Star Wars Episode 7 came out this last week. I am a huge Star Wars fan and my two year wait finally came to an end on Thursday. Thank goodness I have the patience of a Jedi. I tell friends all the time that the first three Star Wars Episodes have a much bigger political overtone than people care to realize. You see, in Episode One you have this Senator from Naboo. Palpatine is his name. He is not really well known and he does not have a lot of pull in the Senate. So he creates a conflict on his own planet by working secretly with the Trade Federation to stage an attack. Ultimately the Jedi thwart the invasion he instigated, but the event gives the Senator the influence with the Galactic Senate he needs to be elected its President. Then Palpatine uses his rising political stature and the ignorance of his fellow Senators (mainly Jar Jar Binks) during yet another war he covertly created to become Supreme Chancellor. As the war progresses, the Senate continues to relinquish more power to the Chancellor for “political expediency.” He then “ends” the war and places the blame on his opposition; the Jedi. He exterminates them except for Yoda and Obi Wan who go into hiding. Then as Palpatine tells an enthusiastic Senate he is reforming the government into a “Galactic Empire,” Padme, the Senator from Naboo and future mother to Luke Skywalker, delivers the best line of the movie. “So this is how Liberty dies, with thunderous applause.” By Episode Four, we are told the Senate has been dissolved and the Galaxy is under Emperor Palpatine’s total rule. George Lucas may have written the Star Wars story back in the 1970s, but this struggle for power has existed as long as man has been on the Earth. Our Founding Fathers knew this, so they created a Constitution protecting our rights and freedoms from government attacks while dividing up governmental power to prevent anyone person or group from taking control of the government. For example, Germany had a much weaker document establishing its government prior to to the rise of Nazi Germany in the 1930s. Shortly after Adolf Hitler was democratically elected to the government, a suspicious fire broke out in the Reichstag Building which housed the German Legislature. While the fire was blamed on the Communists at the time, many historians now believe the Nazis set the fire themselves to create a panic among the populous. That panic allowed the Nazis to reform the government. They quickly acted to end democratic elections to maintain power. They removed all opposition by imprisoning them or putting them to death. And they suspended the civil liberties of the citizens so no one could questions their motives. All while the German people cheered and rallied around their new leaders. Sounds a little like Star Wars doesn’t it? But Star Wars happened “A long time ago in a Galaxy Far Far Away.” Nazi Germany happened a little over 80 years ago across the Atlantic. Ronald Reagan once said, ” Freedom is never more than one generation away from extinction.” Hitler proved it. We must make sure we elect responsible men and women who will continue to protect our rights and liberties by defending the Constitution. And we must remove those from power who put their own selfish wants and desires before the rights of their constituents. 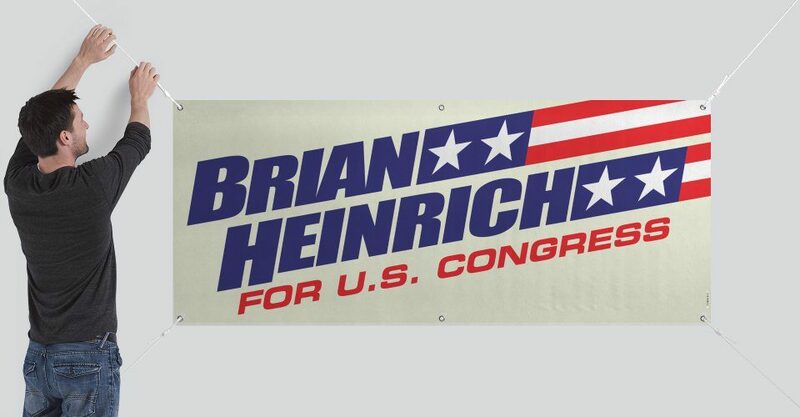 My name is Brian Heinrich and I am running for US Congress in Oregon’s 1st District.